Action at Maiwand Map. 1892. Perry-Castañeda Map Collection, University of Texas. In Wikipedia Commons. Accessed August 30, 2010. http://en.wikipedia.org/wiki/File:Action_at_Maiwand_map.jpg. Amir Yaqub Khan. Khalilullah Enayat Seraj Collection, Williams Afghan Media Project, Williams College, Williamstown, MA. Burke, John. Captured Guns [Sherpur Cantonment, Kabul]. 1879. Courtesy of the British Library Board, London. Burke, John. General Roberts and Staff [inspecting Captured Afghan Artillery, Sherpur Cantonment, Kabul]. 36. 1879. Courtesy of the British Library Board, London. Burke, John. Group British Officers (Q.O.) Guides. 1878. Courtesy of the British Library Board, London. Burke, John. Group. The Amir Yakub Khan, General Daod Shah, Habeebula Moustafi, with Major Cavagnari C.S.I. & Mr Jenkyns [Gandamak]. 1879. British Library, London. Burke, John. Kohistani and Hazara Combatants [Kabul]. 1879. Courtesy of the British Library Board, London. Burke, John. Officers of H.M. 51st Regiment on Sultan Tarra, Showing Different Service Uniforms Worn (detail). 1878. British Library, London. Burke, John. Panorama [of Kabul] from Siah Sung. 1879. British Library, London. Burke, John. Upper Bala Hissar from Gate above Residency [Kabul]. 1879. Courtesy of the British Library Board, London. Burke, John. Upper Bala Hissar from West [Kabul]. 1879. Courtesy of the British Library Board, London. "The Great Game: Britain Keeps the Russian Bear from India." Digital image. The Great Game. Accessed August 30, 2010. http://myweb.tiscali.co.uk/kenanderson/histemp/thegreatgame.html. H2O Alchemist. "The Maiwand Lion." Digital image. H2O Alchemist's Flickr Photostream. Accessed August 30, 2010. http://www.flickr.com/photos/h2oalchemist/379508215/. Mohammad, Yar, and Baz Mohammad. Urozgan Province, Tirin Hotel. Field Recordings: Hiromi Lorraine Sakata. Sakata Music Collection, 1966. Portrait of the Members of Court. Khalilullah Enayat Seraj Collection, Williams Afghan Media Project, Williams College, Williamstown, MA. Russian Troops Crossing Amu Darya 1873. 1889. In Wikipedia Commons. Accessed August 30, 2010. "Save Me From My Friends!" In Afghanistan Old Photos. www.afghanistan-photos.com. Simpson, Sir Benjamin. Ruins of Old Kandahar Citadel. 1881. Courtesy of the British Library Board, London. Unknown. Afghan Women (detail). 1895. British Library, London. Unknown. Royal Horse Artillery Fleeing from Afghan Attack at the Battle of Maiwand. 1880. In Wikipedia Commons. Accessed August 30, 2010. http://tinyurl.com/33dmt97. In the 1870s, Afghanistan once again found itself as a playing field for games between empires. And once again, that game didn’t turn out as planned. Afghanistan was considered to be strategically important because if the Russians gained control of it, they would have a warm water port in the Indian Ocean, and they could potentially jeopardize the integrity of the Raj, over the British control of India. In the 1870s, Russia began making advances near the Afghan border. Sher Ali Khan was worried they would attack and began asking the British for support. In 1878, Russia sent an uninvited diplomatic mission to Kabul. Sher Ali Khan tried to stop the party, but failed. The British saw an opportunity. They demanded that Sher Ali Khan also accept a British diplomatic mission to Kabul. 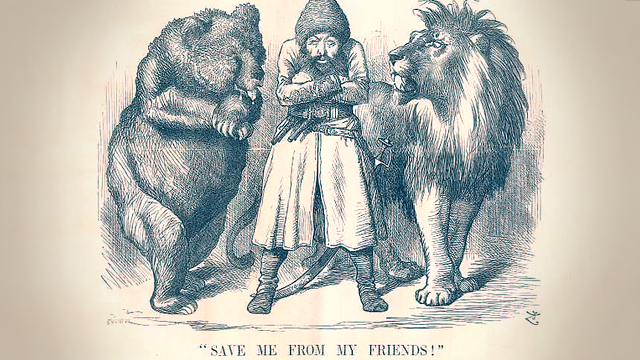 Sher Ali Khan found himself caught between the Russian bear on one side, and the British lion on the other. He decided to refuse the British request. But the British responded to this snub by forcing their diplomats across the Khyber Pass. When they were turned away, the British resolved to invade. They sent a force of 40,000 troops, attacking Afghanistan from three different angles. Sher Ali Khan retreated to Mazar-i-Sharif, where he died only a few months later. In May of 1879, Sher Ali Khan’s son, Yaqub, signed the Treaty of Gandamak in order to prevent a British invasion of the rest of the country. The British agreed to protect Yaqub in exchange for control of all Afghan foreign affairs. But the British were far from winning the war. Battles with the Afghans sparked throughout the country. Perhaps the most famous was the Battle of Maiwand – fought in the ruins of the Kandahar citadel, where an Afghan force of 25,000 men overwhelmed the British force of 2,500. This battle would produce an unlikely heroine. There’s a famous heroin in Afghan history Malalai, who at the battle of Maiwand which is when the British were defeated by the Afghans in the second Anglo-Afghan war the battle was going backwards and forwards and it was said that the Afghan troops got discouraged and were about to run away. And Malali came up onto the battlefield, pulled her scarf off and then said that if these cowards ran away, you know they didn’t deserve to be called Afghan. She shamed them and they attack again and they defeat the British and she’s considered the heroin of that battle in part because you know she was saying, you want to act as men, go back there and fight. And fight they did. The British forces were decimated and British morale throughout the country sunk to an all-time low. Back in Britain, the battle would be commemorated by the Lion of Maiwand. But not before popular support for the war had slipped away. The British people wondered why their government was spending so much money and manpower on a country so far away, and they questioned the logic of the effort. Political cartoons like this one suggested the British were being turned into fools. This cartoon shows the British Prime Minister and the Russian bear, and the interesting thing, and it’s meant to illustrate the idea of the Great Game. But you see that the Russian bear has the flute in his mouth, and he seems to be making the British Prime Minister dance, rather than the British Prime Minister making the bear dance. So I think it illustrates the way in which neither side was really in control. Each side thought it was in control, but in fact the game that they were playing was a dance, that there was really no winners. And from the point of view of a lot of people, didn’t make much sense. Afghanistan once again found itself as a playing field for games between empires. And once again, that game did not turn out as planned.